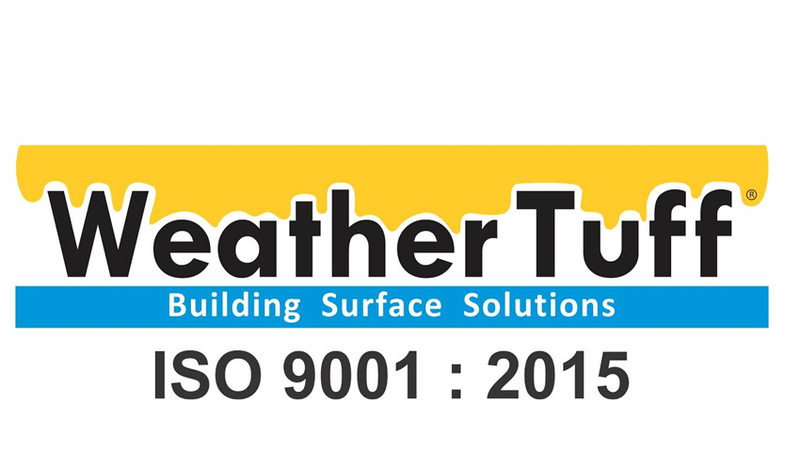 Leading Manufacturer of grey chemical tile adhesive, tile fix nsa grey chemical, cementitious tile adhesive, tile fixing chemical, tile fix adhesives and tile adhesives from Ahmedabad. We are offering a wide range of Tile adhesives Chemical. Any stone,vitrified tiles,Granites, Marbles etc can be fixed. We are offering a wide raneg of Tile Fix NSA Grey Chemical. Tile adhesives are unique formulation to be added while developing cement concrete to enhance work ability, strength and durability. These adhesives are the combination of cement,silica and binders. It is a chemical activity offers internal curing and produces much denser concrete resulting highly impermeable strength. very tight bonding with the surface. We are instrumental in offering a wide assortment of Cementitious Tile Adhesive (All types of Tiles And Stones) to our esteemed patrons. These offered products are manufactured using single component of Grey or white powder that are made out of cement, dry polymers and cellulose derivatives. These powders find extensive application in fixing ceramic tiles, marbles & mosaic tiles on exterior & interior surface of the wall and floor. It can also be used for fixing new tile on old tile surfaces. 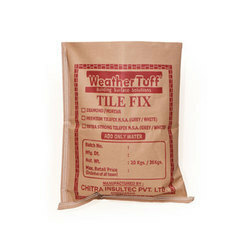 Tile fixing work can be done very fast compared to conventional method. It saves labour & time drastically. Fixing of ceramic, Glazed, Mosaic tiles on walls & floors. 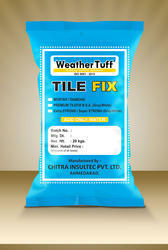 We are offering a wide range of Tile Fixing Chemical. 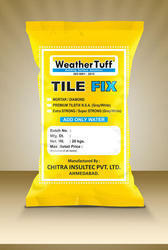 We are one of the noteworthy enterprises engaged in offering superior quality Tile Fix Adhesives. The offered adhesives are a single component grey / white color powder made out of cement, dry polymers and cellulose derivatives. It is recommended for fixing ceramic tiles, marbles and mosaic tiles on exterior and interior surface of the wall and floor. It can also be used for fixing new tile on old tile surfaces. Apart from this, clients can get the adhesives from us at cost effective rates. The surface should be free from Oil, Grease, Fungus & Algae. Mix powder with water in ratio of 3 parts powder & 1 part clean water. Mix it thoroughly & make homogeneous paste. 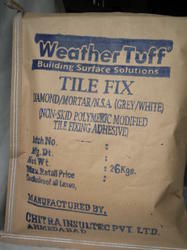 Apply this paste with notched trowel on substrate or apply this paste in the reverse side of tile. Press the tile up to 2 mm. of adhesive mortar thickness to make a good bond with the substrate. Remove the excess adhesive from the side of tiles. Clean the tiles with damp sponger or cloth. If the surface is very smooth then put diluted acid on the surface & then wash it thoroughly with water. It makes surface rough for good tile bonding. If surface is only or greasy, then wash it thoroughly with detergent solution followed by clean water. Fixing of ceramic, Glazed,Marble,Granite,any natural stones, Mosaic tiles on walls and floors. 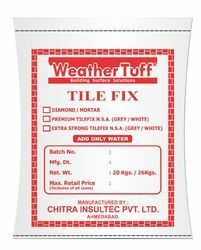 We are instrumental in offering a wide assortment of Tile Adhesives to our esteemed patrons. These offered products are manufactured using single component of Grey or white powder that are made out of cement, dry polymers and cellulose derivatives. These powders find extensive application in fixing ceramic tiles, marbles & mosaic tiles on exterior & interior surface of the wall and floor. It can also be used for fixing new tile on old tile surfaces.